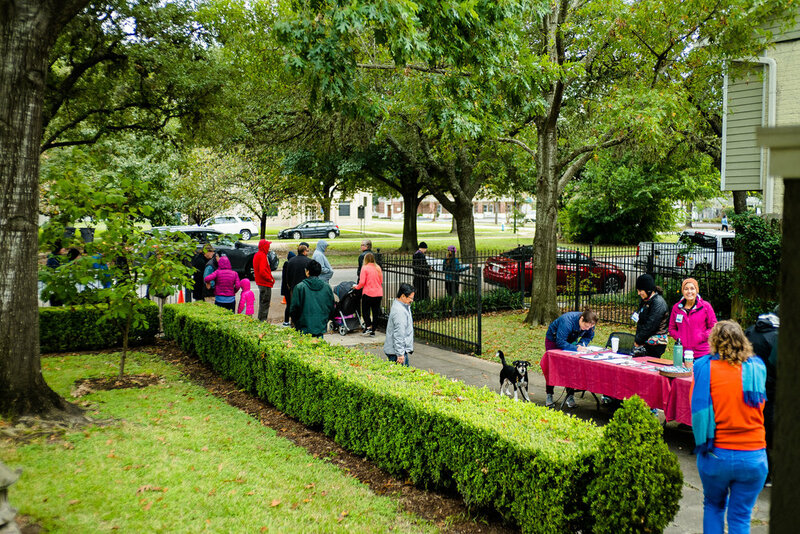 On Saturday April 13, friends and sangha members gathered on Lay-Entrusted Dharma teacher Mary Carol Edward’s 11 acres of land in Alvin to request the blessing of all the Buddhas in the 10 directions for her new Green Star Wetland Plant Farm. We walked the perimeter of the wildflower-bedecked land, pausing at all the cardinal points to invite the Buddhas of each direction to support and bless this land. Please feel free to ask Mary Carol for details on her plan to grow millions of wetland plants to help restore and protect the landscape that surrounds and supports each of us. Our Head Monk, Hondo Dave Rutschman, is here to meet with people, give a class, and offer a dharma talk. On Sunday, circling around the flower bedecked altar, pouring clear water over the baby Buddha, welcoming Buddha after Buddha. About 75-100 Cedar Waxwings flew into the garden this week, attracted by the berries on the trees we planted a few years ago. The classes for the Summer and Fall are listed on the course outline below (PDF). It is with sadness that we share with you the passing away of our dear friend Terry. He died on Saturday March 2. The steady presence with which he met the last few months of his life is an enduring gift to all of us, his family and friends alike. We have observed the traditional powerful ceremonies for Terry, and we will continue to care for him by invoking the protection and guidance of the Buddhas and Bodhisattvas every 7th day for 49 days. You are invited to attend any of these ceremonies. Here is a link to the ceremonial schedule. Jeri Lynn, Terry’s beloved wife, and Terry’s children are profoundly grateful to all you for your care and attention during Terry’s illness. Jeri Lynn invites you to a gathering of remembrance for Terry at the family home on Saturday March 23, noon. You are invited to offer remembrances, stories, and/or anecdotes about Terry. Please contact the office for directions; their home is very close to HZC. The formal funeral will be held at Zen Center after 100 days, on May 25. The time will be announced later. Everyone is invited to attend the solemn funeral ceremony, followed by a reception in Terry’s honor. Terry’s Dharma Name is Shōhō Kōji, Hearing Dharma, Steadfast Compassion. Terry’s obituary appeared in the Houston Chronicle on March 12, 2019, link here. Laura sends her greetings from Green Gulch Farm/Green Dragon Temple! Mindfulness for Third Graders? A lovely article in the Chronicle about Sally Muñoz’ series of classes with children. Traducción en vivo de inglés a español está disponible todas las semanas en el Houston Zen Center! Merilyn Oliveros es una de las bodhisattvas que transforma el dharma. Si necesita más información, favor de enviar un correo electrónico a la oficina. Live translation from English to Spanish is available every week at Houston Zen Center! Merilyn Oliveros is one of the bodhisattvas who transforms the dharma. For more information, email the office. Beloved Terry has officially entered hospice care, while remaining at home with his loving family. His days are filled with grace, his presence and clarity are strong, and his practice is deep. I know he would love to hear from you, a brief note or call. Terry has been an amazingly talented artist and you can see one of his beautiful drawing/paintings at MFAH in the staff show in the Beck building. It is called The Cartographer. It is deeply inspiring to spend time with Terry as he generously shares his joy, his practice, and his deep love of his family, his sangha, and all beings. To connect with Terry, please let one of our co-tantos Louise, or Gayle, know and they will facilitate the connection. The February sesshin talks are now available on the website. Thank you for the successful Year End Appeal!! Thank you from Laura, the President of HZC, for your wonderful generosity and the outstandingly successful year-end appeal campaign. Happy New Year! New President of the Board, Laura Salazar-Hopps, assumes her responsibilities officially today, January 1. Tricia McFarlin, the outgoing President, will be standing by with support and continued participation on several committees. Zen Center is fortunate indeed to have the skilled leadership of two such talented, dedicated, and creative Zen practitioners. Outgoing Board member Forbes Alcott will be much missed on the Board, but will continue his dedicated practice in other dimensions at HZC. Thank you Forbes! 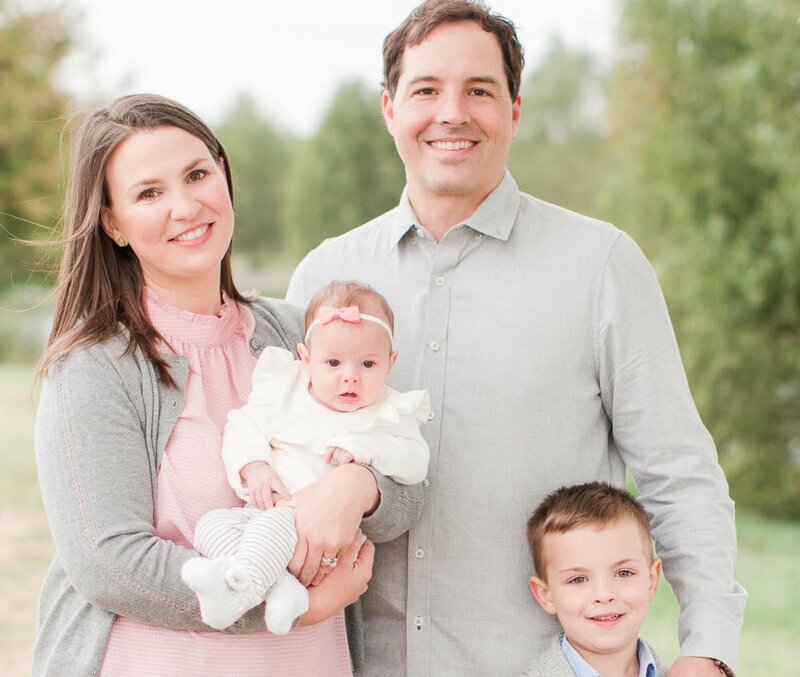 Zack Becker and Eileen Dwyer are two new members of the Board of Directors. They are joining an awesome team. Thanks to everyone on the Board for your service. The on-going stability of HZC is a testament to the Board’s skill and dedication. Tom Biddle will lead an exploratory meeting to prepare for a study of Dogen scheduled for February to March. In order to prepare for his offering of a study of Dogen, the Soto Zen founder and a deep and challenging teacher of the Way, Tom Biddle has graciously offered to hold an introductory meeting to determine the interest of potential students of his class to be offered February 11 to March 11.
the way to practice with traditional Buddhist scriptures and Zen dialogue encounters, or koans. From the input gathered in this meeting, a series of discussions on the selected themes will be held over the five Monday evenings from February 11 to March 11. Tom is a long-standing senior member of the Houston Zen Center. He has offered studies of Dogen in past years and has offered dharma talks to the sangha as well as serving in various leadership roles over the years such as Work Leader and acting Ino. Please, plan to attend this brief introductory session and offer your ideas as to the areas of Dogen study you would most like to pursue. 2018 has been a year of growth, steady deepening of practice, and many important accomplishments. President Tricia McFarlin shares some of the news with everyone. Bruce McMills, member of Zen Center for more than 20 years, died Saturday morning, December 15, in the arms of his wife Molly. Bruce was instrumental in establishing the welcoming feeling that is still the Houston Zen Center way. Bruce always reached out to new visitors, warmly welcoming all seekers. We will miss him very much. We will hold the 49 day ceremonies for Bruce, whose dharma name Zen Heart, Growing in the Way, is a tribute to his loving heart, his deeply generous nature. For 49 days we will invite the Buddhas and Bodhisattvas to watch over Bruce in this important time of transition. Cards of condolence are welcome; please contact Joy in the office for the address. Sesshin 2018. Photo by Isshin Glen Snyder. December 9, 2018, Rohatsu Sesshin came to a beautiful conclusion with the ceremony honoring Shakyamuni Buddha’s Enlightenment. Sitting together, gathering the mind, practicing intensively together, encourages all the participants to go deeper into Zen practice. 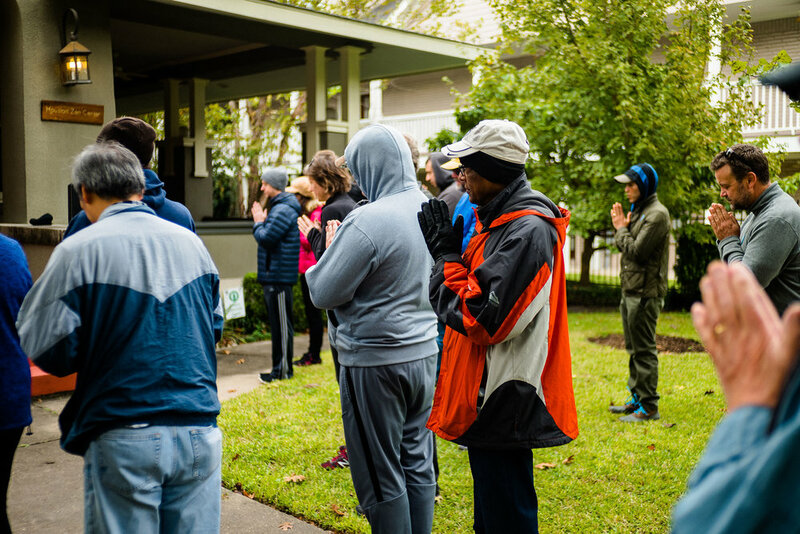 We dedicated the effort of the sesshin to peace in the world, and to benefit all the members and friends of Houston Zen Center during this season of the year. Dharma Talks by Abbot Gaelyn, Shuso Hondo Dave Rutschman, and visiting senior member Lynn Snow, are available online. Konjin Gaelyn Godwin Roshi receiving the appointment as the new Director of the Soto Zen Buddhism International Center at Sotoshu Shumucho in Japan. Photo via Soto Zen Buddhism International Center on Facebook. On October 1, our Abbot, Konjin Gaelyn Godwin was appointed the new Director of the Soto Zen Buddhism International Center. She is both the first woman and the first Westerner to hold this position. As a part of her new role, she will travel to Zen Centers and monasteries throughout the North and South America, and Japan, giving talks and offering teachings. Deep bows and congratulations to Gaelyn Roshi. Her appointment was also recognized In the San Francisco Zen Center newsletter and in “Lion’s Roar” magazine. 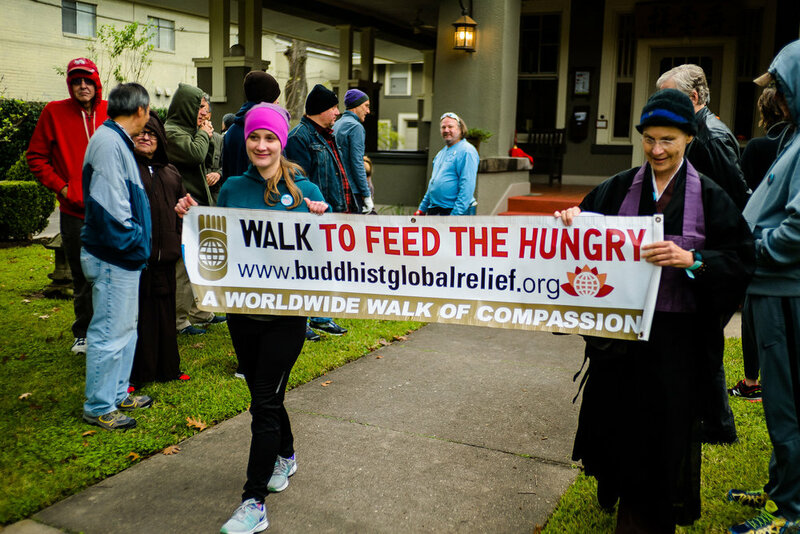 Read more at Lions Roar, and San Fransisco Zen Center News. 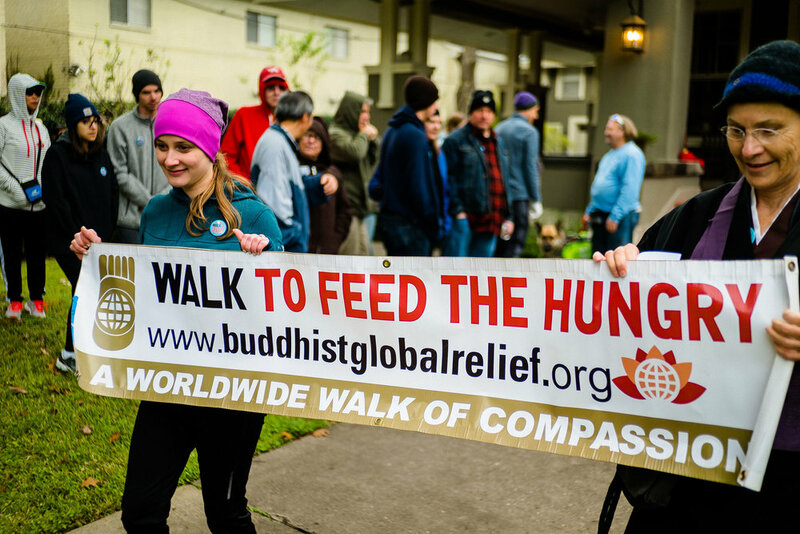 Some amazing photos from members Daniel Salazar and Richard Battenfield of the recent walk for Buddhist Global Relief. Our newest member, Eleanor Lou, was born July 26, weighing in at 6 lb 9 oz, to Clayton and Elizabeth Garrett and big brother Olin. There were some complications, but all is well, and we’re counting our fingers and toes until we get to meet her!